The name plaques are amazing as dimensional pieces, fresh off the MultiCam but as we apply the paint, glazes and gilding they become spectacular. Becke did the bulk of the painting on this year’s workshop plaques and after so many years of applying her magic touch she has become a master carts man at the task. I’ll briefly describe the techniques she used for each attendees plaque. All plaques first got a hand brushed Coastal Enterprises waterbed primer hand brushed on to achieve a subtle texture coat. This texture coat gives the glazes a much more pleasing effect and also makes the metallic paints and gilding sparkle. 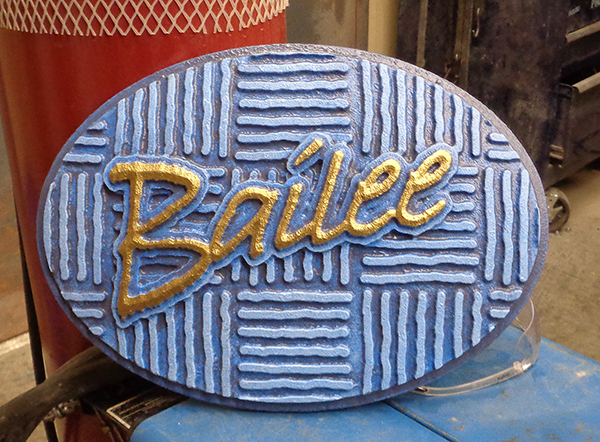 Bailee’s plaque started out with three coats of light blue – all painted by hand. Then a medium blue glaze was applied followed by a navy blue shade of blue glaze. The lettering was painted with Modern Masters metallic gold. Caitlyn’s plaque received three coats of light tan, followed by a medium brown glaze and finally a glaze we call ‘Sawatzky brown.’ It is a custom brown which has a little purple in it. The lettering is a two color blend of a lime and apple trees – both Modern Masters metallic acrylic paints. 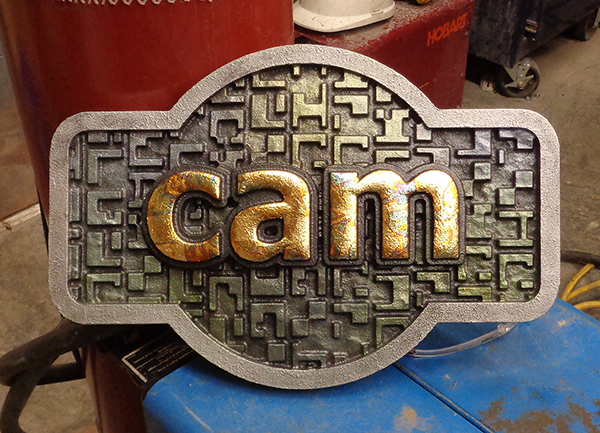 Cam;s plaque was painted with three shades of Modern Masters metallic greens. The outside border received a silver metallic. Becke mixed up two colors of glaze, the first we call ‘swamp’ and the second is a dark brown. The lettering was gilded with a red variegated gold. 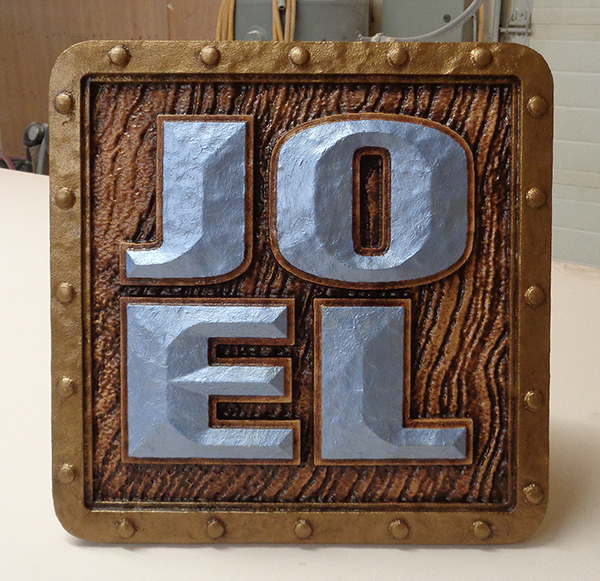 Joel’s plaque started with three coats of tan. Then a medium glaze was applied. Next the outside border received two coats of Modern Masters metallic gold. A ‘Sawatzky brown’ glaze was then applied over the entire name plaque. Then Becke painted the metallic blue on the letters followed by a dry brush blend of a lighter shade to make the prismatic lettering really jump. 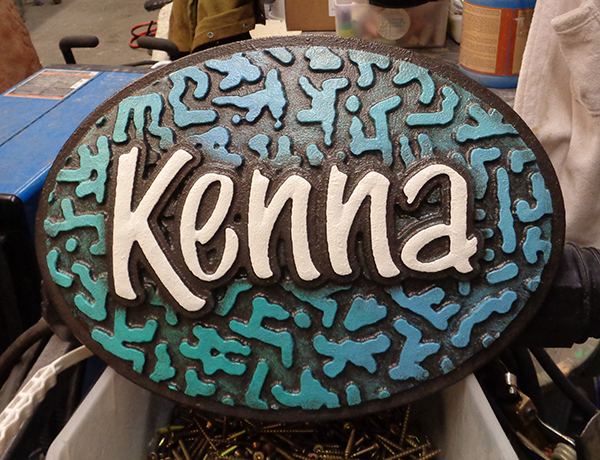 Kenna’s name plaque received a blended base coat of medium blue and a shade of teal over the entire surface. Then a dark brown glaze. The domed lettering got its double coat of a warm white for maximum impact. 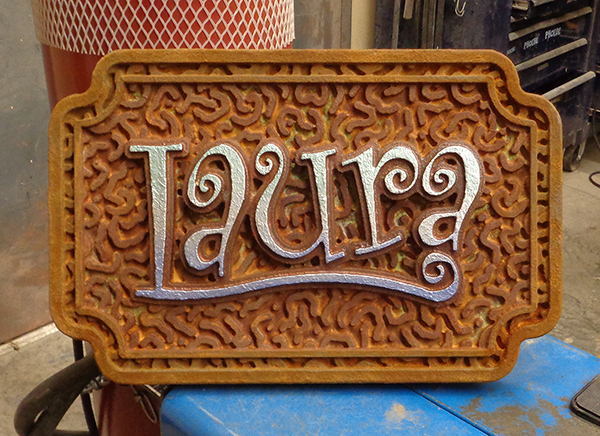 Laura’s name plaque received two coats of reactive metallic iron paint before it got a shot of acid to make it rust. Becke applies a second coat of the mild acid to get the green patina on the background where it puddled. She then clear coated the letter outline as well as the letters. This darkened that area slightly to make the lettering stand out a little more. It also sealed the area making sure the rust paint didn’t bleed through to the lettering top coat. The lettering was painted with a custom blended coat of metallic silver( with a little green blended in) down to a light metallic purple. 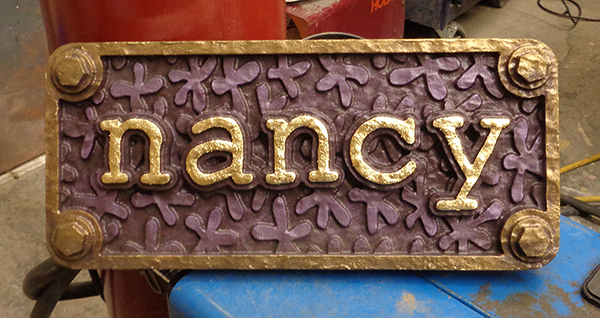 Nancy’s plaque started out with three coats of mauve followed by a dark brown glaze. Then the metallic gold was applied to the outside border. The lettering was then sized and leafed with red variegated gold. 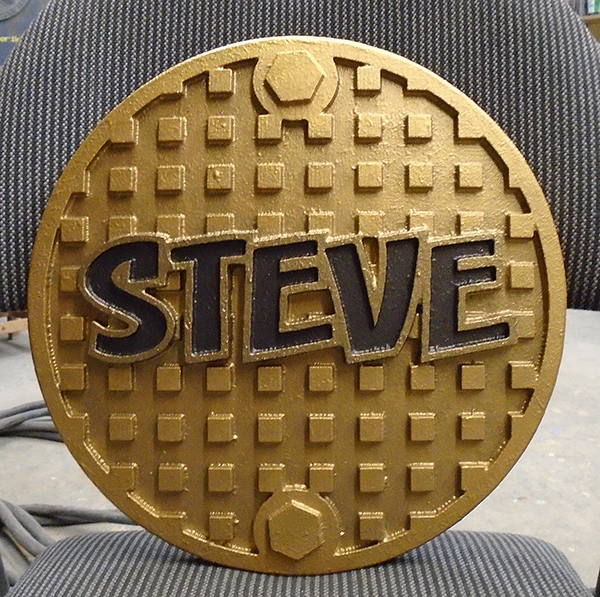 Steve’s plaque was first painted with three coats of metallic gold. The last coat has a subtle blend of three colors of gold with the lightest being on the top and fading down. The tops of the plaque is a solid shade of gold. The inside of the sunken letters then were painted a very dark shade of brown.